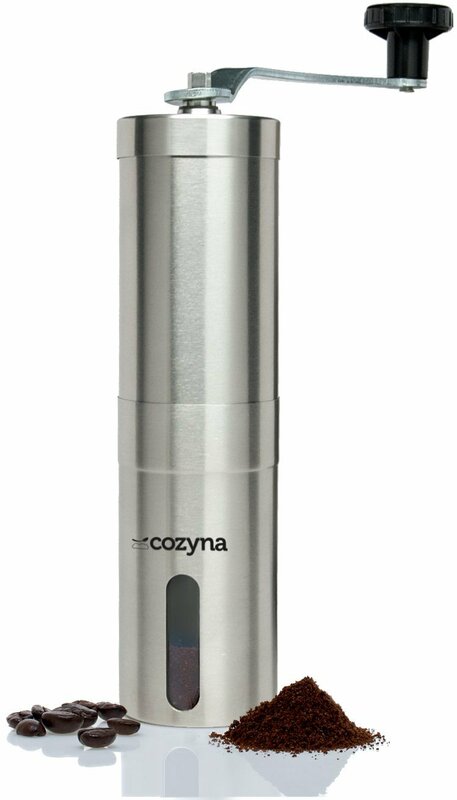 This coffee grinder from Cozyna is really nice. It’s made of stainless steel so it’s a great high quality grinder. It’s well made and will not break on you. It’s really easy to use simply open the top and put your coffee in, attach the handle and turn to grind. You can see through the clear window how much coffee you have and then open up the bottom to remove the ground coffee. The handle turns really easy which makes grinding your coffee easy and seamless. The coffee comes out ground evenly. I was really impressed with this one being a manual grinder but it actually does a great job of grinding the coffee very finely. If it’s not fine enough you can also pour it back in the top and regrind it a second time, but we were happy with the first round. This is perfect for camping or hiking, if you don’t have a way to plug in a coffee grinder then this is a great option to take along with you.